I'm hoping that North America gets the Runday Hoodie one last time before summer...it's still pretty chilly here so it would get a lot of use over the next couple of months!!! Just scored a Zinfandel/Wild Orchid Energy bra for $34 at my local store today. Sizing was more messed up than it was in other Energy bras, and the 6 fit perfectly. I was always a 4 before the plum Energy bras came out. Once those came out, in those and successive colors, the 4 was a little too small, but the 6 was too big--the band was way loose. Have been waiting for Lulu to fix the sizing issue with the Energy bras since then. Anyways, they didn't fix the sizing problems yet, but the 6 in this particular bra was smaller than all the other size 6 Energy bras I've tried on since the Plum ones first came out, and it fit like my old size 4's. I was very excited (almost didn't even bother trying it on!) I loved last winter's color palate of Zinfandel, Wild Orchid, and Surge, and I was bummed they didn't make more things in those colors. They also had Speed Cozy tights for $79 (can't be hemmed, so no go for my short stumps) and some Tata Tamers for $39 (none in my size). They also had a ton of those long, Post Practice Cardi sweaters I every color for I think $79 too. Also had those ugly cardigans with the "trying to be a blazer so you won't notice I'm made out of sweatshirt fabric" too. The girl manning the dressing rooms was wearing that running jacket in camo, and she was bragging how she snarfed it up yesterday as soon as a customer returned it. Oh and that super cute Spring Forward (I think that's the name) jacket that just uploaded last Monday was surprisingly heavy fabric. Super cute in the Cadet and Bali Breeze colors, but it would be hecka hot to run in. I didn't even try it on. I think that grey hooded top might be a base runner hoodie? Are those black camo speed tights in the run day hoodie photo?! I just have to say im totally obsessed with your site love getting fit reviews and seeing upcoming products :) also was angeled some beachscape wup so awesome people do that. so nice to have a site to go to where others are just as addicted to lulu as I am :) thanks for everything you do LLA and thanks to all the Lulu angels out there!!! 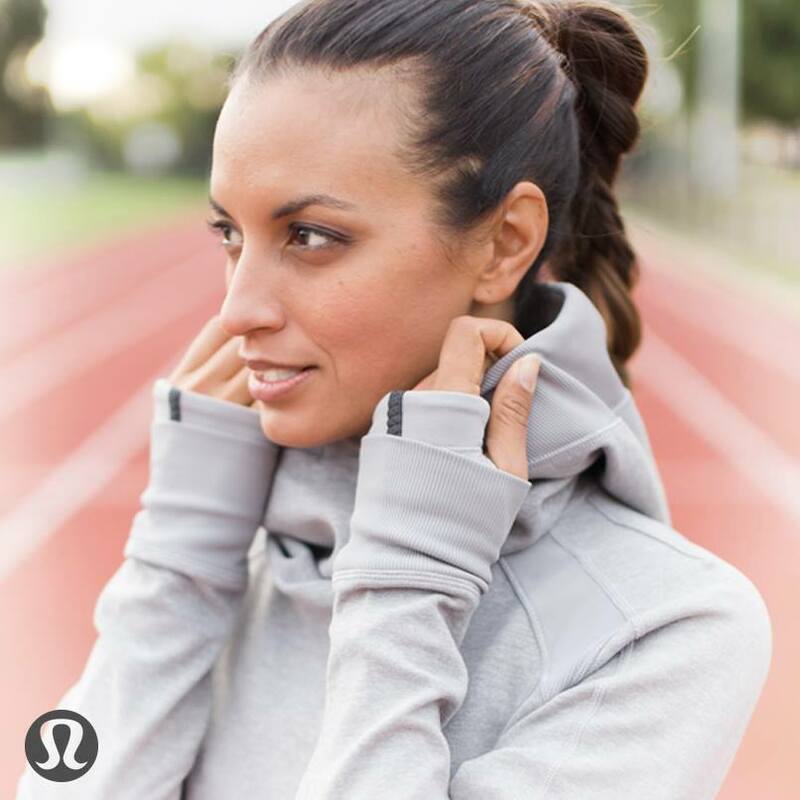 the run day pull overs are gorgeous. thick, warm and cosy. TTS except......when yr getting it over yr head. Pony tails will be destroyed and makeup removed getting this puppy on. Very popular down under. Local store report time! I visited the El Segundo store this afternoon at around 2:00 pm and they had the Beachscape WUPs, though only in sizes 8 and up. They have a full size run of the Yoga Over Skirt in black and gray stripe, lots of Beachscape CRBs, Cadet Blue Wee Stripe CRB, Cadet Blue Wee Stripe Scoop Neck Tank, lots of Camo Formes, and lots of Petite Fleur stuff including the new scarf. The sale racks had the Live Natural Crop on MD for $74 in the gray non-ombre color in sizes 6 and 8. Hope this helps fellow luluaddicts in the area. The more I see the petite flour print, the more it reminds me of granite floor toilet tiles in my favorite mall. Not good. Meanwhile, that creamsicle pop shade is so gorgeous on tanned skin. Perfect for summer! Would love a free to be wild bra in that. 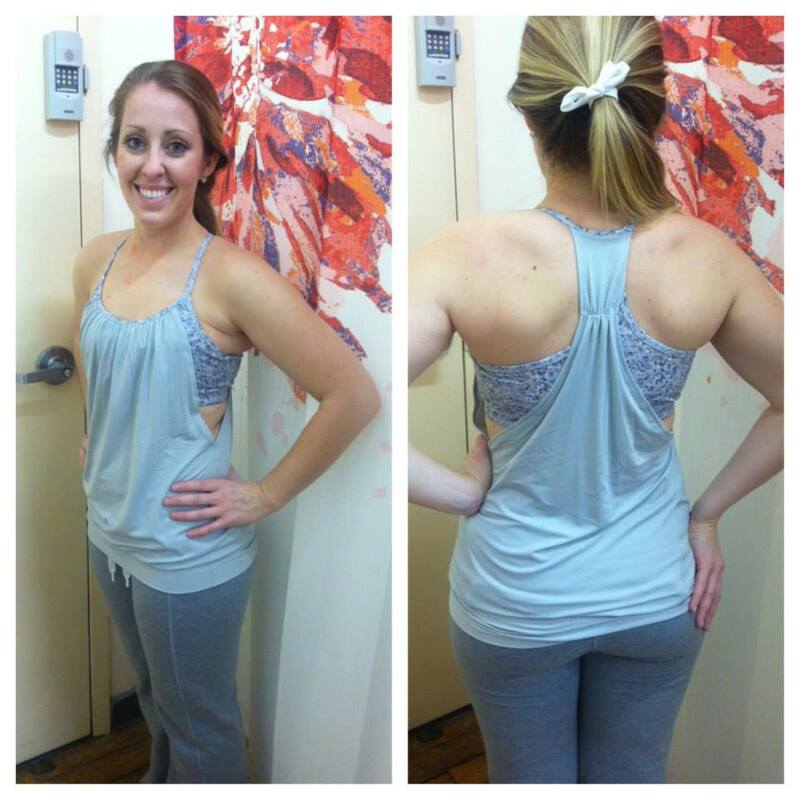 The WAFS cadet blue scoop neck tank is so gorgeous and fits so nicely. It gives a more polished look than the CRB imho. Has anyone seen the mod move crop in fatigue camo in the US stores yet? I have been patiently waiting. Love the antidote bag! Went to my local store to return the Top Speed bra. It fits exactly like the Energy bra with as much support, so not good for me for running. They had a ton of Yogi Anorak jackets on MD, as well as a lot of Fast Track tees. I loved the wide arm openings but is was too loose fitting for me. They also had a ton of stuff on MD in size 4--cozy speed tights, nice asana jackets in surge & paris pink. They had fatigue WAFS WUCs in my size(6). Love the colors but couldnt stop thinking of LLA's comment about feeling like a giant grasshopper in them (ha!) so didn't even try them on. Speaking of Fast Track, I got a striped Athleta LS Chi top & I swear it is the exact same material as the LS Fast Track tee I bought (both are unstinkable too). Will be posting a comparison soon. I tried on the Spring Forward jacket in my local store Friday, and found the fit to be fine in the shoulders, sleeves and body, but tight in the chest area. I'm 5'2, 115 and a 34D, and am a 4 in most Lulu jackets and a 6 in tanks. I tried on the 4 in this jacket, and would've tried the 6 but my toddler was with me and I had to go. The angel blue is so pretty, and I may drop by today and try the 6, since I have a return anyway. Also, I exchanged my white transformation wrap sz 4 for a 2. It seems to run bigger than my other one from the 2012 release. The 4 was baggy in the shoulders and just a teeny bit overwhelming on me; the 2 was a closer and more flattering fit. Depending on the look you're after, slouchy or more fitted, some may need to size down in this wrap. Reading comments, insights, and straight forward product reviews makes this a go to site for me! Read this before I buy almost anything since I do not live near a store. Thanks to everyone that contributes to this blog and especially to LLA. Any sizing info or product ratings on the Transformation Wrap? I am fairly petite so was wondering. Antidote looks more green in this picture. It has appeal. I had the impression it was more fluorescent yellow, like Split Pea, from some of the other pictures. I would still need to see it in person. That hoodie looks appealing...but isn't that the one that had the unanimous reviews that it chokes one pretty badly? I think I passed on it on markdown because of that. Agree, I do not dig the Petite Fleur print at all. Haven't liked it from first seeing it and never will. Even a little bit, like in the No Limit Tank, I'd just not invest my money there. I'd wait for a much nicer one. I really want the Beachscape Wunder Under pants but don't want to pay ebay prices! the new bag reminds me (ever so slightly) of my On The Move bag from a few years ago. 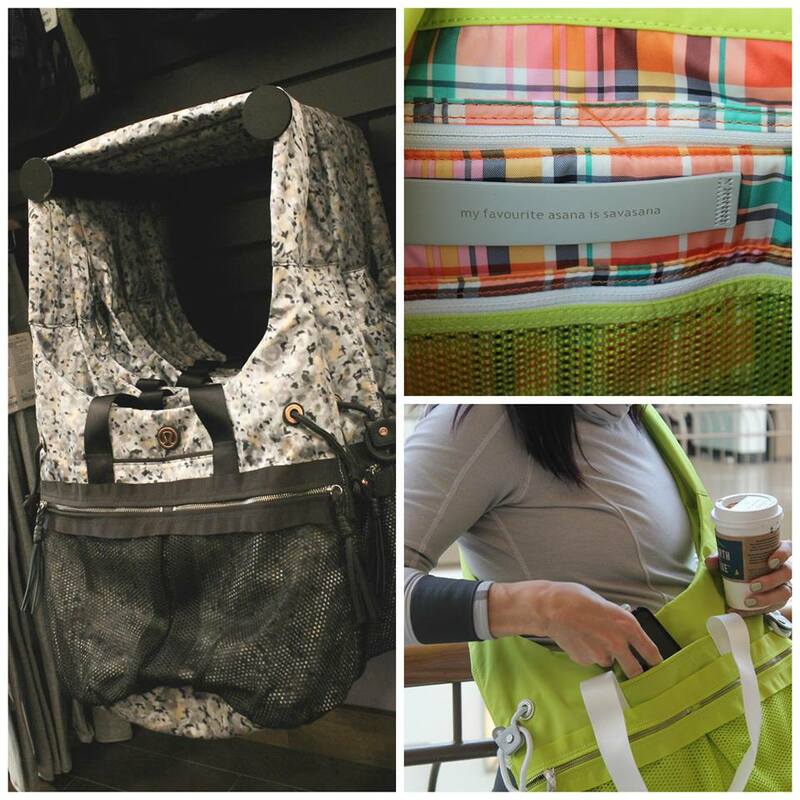 I love it b/c it's great for yoga, gym or just in general - doesn't look at all like a gym bag. this one with the mesh on the outside and the non adjustable strap (i think it's non adjustable) is ok, not awesome. in my opinion. Hi LLA...do you have a purple comparison of let's say Cool Breeze,power purple, lullaby, winter orchid, deep zinf...and anything else relevant? Thanks! I am SO irritated! I've had my camo WUC less than a week and they are already starting to unravel at the seams. I love them otherwise--such a bummer since they're sold out! will LL repair them if i take them into the store? I'm not wild about that bag, mostly because of the mesh on the outside but aso don't really like the extra little handles. The fabrics make it look like a sporty bag but the size and shape are all wrong. Just my opinion! The excitement over the petite fleur print is lost on me, too, but everyone has different taste. That hoodie, on the other hand, is calling my name. I adore my base runner hoodie and wish it had come out in a few more colours. On Friday night, I had a huge score at Santana Row in Norcal. Beachscape WUP, Milky Way WUC, Bordeaux WUP, Cadet Blue Wee Stripe CRB and Cadet Blue TTT. I ordered the Bali Green Power Y, although I would LOVE a Bali Green Ebb to Street tank so I may keep the tags on. I would also prefer Bordeaux Skinny Wills to the WUC so I will be stalking the new uploads! PS. I have 2 rundays (in Surge and Angel Stripe) and LOVE them. I think it is the nicest piece in a LONG time. I just had exactly the same thing happen to my camo WUC - the seams started unraveling at the crotch! I have the exact same issue! Today was my second time wearing them and the seams are completely coming apart. They actually are big on me and I haven't washed them yet so all signs point to poor quality. In the past when I've brought lulu damaged items ( passage sweater) they have taken it back and given me a gift card but never offered to fix things. Such a bummer because it's not like I can find another pair of camo wuc with a gift card! The Petit Fleur is reminding me a bit of the Tree Frog Camo from a few years ago. I have Triumphant Tote in that colour and still love it. The same thing happened to mine! They will either repair them or refund your money. Mandy@5:55, the Speed Cosy tights I tried on were ruched. I just assumed you can only hem things with a straight hem, was pretty sure a ruched hem wouldn't work. That looks like a base runner hoodie?? 6:31 I have a few pairs of the speed cozy tights and love them I am not very tall almost 5'3" and I wear those running and didn't need to hem them I just fold the bottoms up so you can see the reflective strip and they look awesome and are very func tional. What a delight! Milky Way WUP...yup - pant - in store this am (east coast Canada). Beachscape sold out in minutes - apparently only 2 per size was shipped to my store. thanks for all of the replies about the unraveling WUC! and yep--mine are unraveling at the crotch too! mine are not too small on me either, so it isn't that (i'd think that would be a waist-issue and not unraveling at the crotch). i know when i had an issue with the Mula undies doing the same thing, they sent me a GC for the price and told me not to worry about returning the damaged ones (but those were undies, so they didn't want them back). UGH!! so, i guess even if i could find another pair, i run the risk of those unraveling too. what a bummer! Any idea on what time the upload will be tonight? my camo WUC seam at the crotch came undone just by walking in them, I hadn't even workout yet. im taking them back to the store to get fixed.